I have always been aware of the extraordinary power of TV programming and motion pictures. Watching an inspiring movie or uplifting TV program can be such a rich and edifying experience. So, I have often wondered what the world would be like if the TV and motion picture industries were put in the service of enlightening humankind. Frequently I have wished to be graced with the opportunity to watch a truly spiritual cinematic production. I mean one that is so sublime, and so pure, and so elevating, and so instructive as to be of divine origin. Well, I am very happy to say that my wish has been fulfilled in the form of YUNUS EMRE. I have never been a TV watcher, but will watch it when there is a worthy show on. Hence, when the Turkish series YUNUS EMRE became available via Netflix streaming I became ecstatic. Yes, this show — YUNUS EMRE — is that incredibly good! For the curious I would go so far as to write, with absolute conviction, that this series is the single best production ever created. The qualification, of course, is that there must be genuine interest in, if not ardor for, the spiritual journey. Actually, the truth be told, you cannot even describe the sheer power and profound spirituality which this series projects with each and every episode. Watching this awesome show is nothing short of having satsang; and I do mean satsang with a fully Self-realized being. At times deeply moving; at other times quite touching, YUNUS EMRE never fails to ennoble the human spirit. You see, Yunus Emre was a Sufi dervish. Actually, in this show, he is a dervish-in-the-making. And, he happens to live in a Sufi dervish monastery in the rural town of Nallihan, Anatolia. His teacher and spiritual master is Taptuk Emre who was a contemporary of the great Sufi poet-saint Jalal ad-Din Muhammad Rumi. As a matter of historical fact, these two great beings — Rumi and Taptuk — domiciled not too far from each other in eastern Turkey (then Anatolia) back in the day (as in the mid to late 1200s just prior to the formation of the Ottoman Empire). So that’s the historical context; the religious one is that mystical Sufism was in its heyday at this particular time throughout Anatolia. Some of the most exquisite poetry and prose of the Sufi tradition was written and uttered during these tumultuous times. For Mongols invasions were on the rise throughout Asia Minor and the people were full of fear and trepidation…as well as in great need of divine protection. In fact there’s not even a close second. That’s because watching YUNUS EMRE is a full-blown spiritual experience from the inside of a genuine ashram. It’s literally like watching sadhana play out on the screen. Not only is it very subtle at times; it can also be quite graphic. Oftentimes, wonderfully transcendent scenes play across the screen; however, there are also instances that are grimly mundane. Above all, this awesome series has the transformative spiritual power to radically change your life—in the blink of Shiva’s third eye. I have often found myself changing my behavior, or my thinking, or my feeling, because of watching this sacred series. I don’t mean for a moment or a day, mind you; but rather for a stretch of time that I knew the TV-presented lesson(s) had really changed me. There has never been another TV show that sticks with me throughout the day and night; morning, afternoon and evening; and for weeks on end. The numerous vital messages are so impressive and delivered in such a potent fashion, that you just want to “get with the program”. In this particular case, an extremely dharmic lifestyle and yogic attitude. There are two lessons, specifically, which I found unusually compelling. First, that every word that is spoken in the dervish monastery is measured and never wasted. important virtue — yogic silence — into constant practice is a must for every sadhaka. Yunus really teaches this well. Watching him and his fellow truth seekers walk the spiritual path in such a disciplined manner is inspiring to the extreme. Their economy of words, their considerate choice of language, and their respectful expression of positive feelings and strong emotions alike provide tremendously valuable lessons. If nothing else, one cannot help but to learn from Yunus the rare virtue of dharmic speech. Secondly, that wherever we live and work and play really ought to be considered our “monastery”. That wherever we lay our head at night truly is our “ashram”. Watching Yunus come and go, as he did in real life, is particularly instructive in this regard. By always keeping alive the Guru’s teachings in his heart, no matter where he was or what he was doing, Yunus poignantly dramatizes this essential quality of a seeker. He never fails to provide an excellent role model to aspire to as he faces his never-ending trials and tribulations. Above all, his true story reflects how sadhana is not only a full-time job, it’s a 24/7 commitment without a moment’s lapse. But the real beauty of this series is how the viewer is imbued with the notion that the entire world is just one HUGE ashram. Yunus Emre, as the exalted character passing through life’s many challenges, makes this so very palpable. You can actually see it; you can hear it and feel it — that the whole world is Shiva’s garden — in every frame of every episode of YUNUS EMRE. Yes, this series has the potential to refresh your sadhana like no other. It will galvanize you to live your sadhana 24/7, instead of just playing Sunday or Saturday morning spiritual warrior as many of us were conditioned to do in our various mainstream religions. Honestly, there are not words that can sufficiently describe the deep impact of a highly spiritual production such as YUNUS EMRE. It’s as though the gods themselves came down from heaven to stage this incomparable series. If you are a Kundalini Yoga practitioner, it’s as though the Siddhas came down from Siddhaloka and created an earthly TV set in pre-Ottoman Empire Turkey, and then assumed their respective roles. Every actor in YUNUS EMRE seems to have an authentic understanding of sadhana, as well as an appreciation for the true Master, which cannot be coming from a script. These TV saints-in-the-making are, it appears, the real thing and doing the greatest reality show on Earth—EVER! So much so, in fact, that the viewer receives the teachings in a most accessible and thoroughly entertaining way. In this manner the viewer leaves each episode rejuvenated having just taken a bath in Guru’s grace. One’s inner vision becomes crystal clear again. Glimpses of Shiva drishti are experienced even if just for a moment. For the viewer has just had satsang with a great Sufi saint(s). Anyone who harbors a desire to watch at least one deeply spiritual program in this lifetime will not be disappointed with YUNUS EMRE. However, there is just one glitch with this series and that is that the subtitles are not always precise translations. In some cases they may not even be good translations, while a few are rendered in contradictory language. This reality necessitates extraordinary focus throughout the viewing of the entire series. But even this inconvenience seems to be by divine design; for the viewer is compelled to understand some of the greatest teachings through the language of the heart, not the spoken word. For those not currently engaged with an authentic spiritual path, there may be other challenges which arise. For example, there are many subtleties and nuances associated with living at the feet of a true Master. Much of what goes on is of an interior nature far from the experience of the physical senses. In light of this common experience across all mystical traditions, a newcomer might find much to misunderstand or not completely comprehend. Nevertheless, just by exposing yourself to such sublime and sacred programming the viewer is destined to be transformed. How’s that for spontaneous spiritual alchemy? May we all become like the illustrious Yunus Emre and Taptuk Emre, the exemplary Sufi saints of 13th century Anatolia. 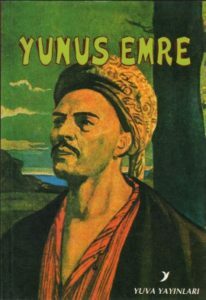 CAVEAT: The YUNUS EMRE series is so very good that it’s quite likely you will never want to watch another TV series or movie again. However, the good news is that each episode is so pregnant with profound meaning and spiritual wisdom that it’s also quite likely you will re-watch the whole series … again and again and again. Yes, YUNUS EMRE really is that exceptional. For it offers real soul food that is as gratifying as anything you will ever let your eyes and ears feast upon concerning your TV viewing. YUNUS EMRE presents a particularly compelling representation for the proverbial “Lord’s Club”. Far beyond that, however, this series confers the profound understanding on the viewer of how important it is for a just society to be both spiritually oriented and dharmically ordered. This show cogently infuses one with equality consciousness. Each person’s place in the community can be seen as integral to the wholeness and welfare of the collective. Regardless of one’s work, all work is seen as sacred and valued. Yunus himself went from being a highly respected cadi (judge) to a ‘lowly’ dervish overnight. He even became a dog catcher for the lodge. Yunus went from being a farmer to a counselor to the local lord, and then to being the lodge woodsman. Under the guidance of his master Taptuk, he eventually became a great Sufi poet and writer. In this role, Yunus was responsible for translating scriptural texts into the native tongues of Anatolia. Until then, these holy books were available only in Arabic and Persian. 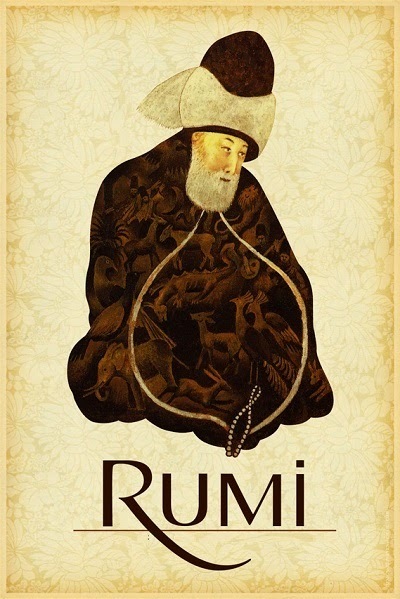 Lastly, Yunus Emre became a wandering dervish — at the command of his Guru — whose devotional poetry and compassionate countenance brought needed consolation to many souls. 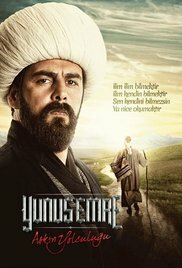 We have begun watching YUNUS EMRE for the second time and find it to be even more fulfilling than the first viewing. Not only is this spiritual and mundane journey extremely enjoyable to watch, it is instructive to the max. The translation appears to have been cleaned up a bit so it’s much easier to understand. Whenever one’s awareness is so heightened around the sheer yogic power of a spiritual program, it has considerably more impact. It’s like sitting at the feet of the Guru, receiving His or Her teachings right from the mouth of Lord Shiva. There’s nothing like a fully conscious viewing of what is essentially one man’s sadhana unfolding on the screen. The lessons are fast and furious, as well as profoundly moving and compelling. The operative word above is compelling. Watching an earlier episode about Yunus projecting his intense anger in the wake of his master’s teaching on A N G E R was quite the “teaching in action”. Not only did Yunus never inappropriately express his anger again, by shining the light of his awareness on his anger samskara, the Master eradicated his unhealthy inner rage. Yunus showed this viewer how to look at their anger so that it would not be improperly projected, especially at innocent souls who happen to be in the wrong place at the wrong time. It’s now clear that this very special series is so didactic that as one advances on their own spiritual journey, they will glean even more yogic wisdom with each successive viewing. In other words, the third and fourth viewings of this series will be even more enlightening than the first two. WOW! 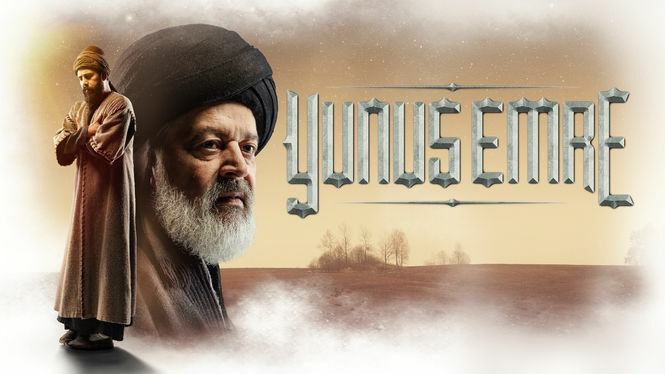 It’s no coincidence that YUNUS EMRE was first shown on Netflix during a period of Turkey’s recent history when the country was being assailed by outside forces. Likewise, 13th century Anatolia was under great assault from the invading Mongols as well as experiencing multiple internal threats. That Turkey today has been at the center of turmoil in the Middle East is no accident of fate; nor is its gradual return to Islam and away from a secular government. Neither is the exquisite rendition of mystical Islam — Sufism — which is a true reflection of the Muslim religion. In this way, the people of the world are being treated to a much more accurate and very positive version of Islam. 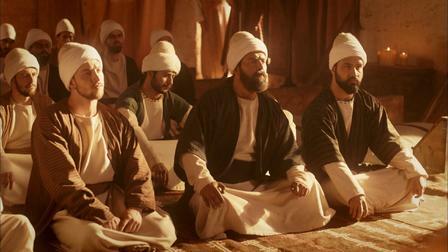 As a matter of fact, this obvious labor of love on the part of the writer/producer has gone a long way in introducing their global audience to the original Islamic faith tradition. Not the fabricated and militant religion of Wahhabism (radical Sunni fundamentalism); rather, to the original Islamic spirituality of love and peace, devotion and obedience as taught by The Prophet. In YUNUS EMRE the true teachings of the Quran are expounded upon as though they issued forth from the mouth of Muhammad himself. For these and many other reasons, this TV series has been highly instrumental in gifting the world with an authentic and much-needed representation of Islam.